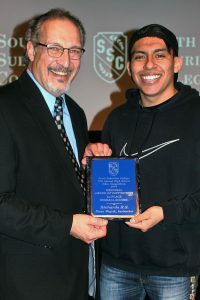 SOUTH HOLLAND, IL–South Suburban College (SSC), with the assistance of Career Development Systems (CDS), hosted the 12th Annual Video Competition on Thursday, April 4, 2019, in the Kindig Performing Arts Center. The competition showcases talent from high schools as well as provides tours of the college’s facilities, including the television studio, audio studio and multimedia lab. Seven high schools submitted entries into the competition: Bremen, Eisenhower, Oak Forest, Richards, Shepard, Southland Prep and Thornwood. Students entered work in eight different categories: Commercial/Promo, PSA, Short Subject, Music Video, Live Multi-Camera Program, Creative Editing, News Story or Feature and News Program. The 51 entries were judged on aesthetic quality, technical quality, program design and overall effectiveness. Commercial/Promo: First Place, “This is Shepard, We Are Astros” – Shepard; Second Place, “Locked In” – Thornwood; Third Place, “Winterfest” – Bremen. PSA: First Place, “You Are Not Alone” – Eisenhower; Second Place, “Tell Me Your Story” – Shepard; Third Place, “Domestic Violence” – Thornwood. Short Subject: First Place, “Unprepared” – Bremen; Second Place, “Snapped” – Eisenhower; Third Place, “Escape from LEGO City” – Richards. Music Video: First Place, “Laundry” – Shepard; Second Place, “So Far Away” – Richards; Third Place, “Holiday Mashup” – Bremen. Live Multi-Camera Program: First Place, “The Late Night Show” – Bremen; Second Place, “Late Show with Michael” – Oak Forest. Creative Editing: First Place, “The Purge: Rosewood” – Thornwood; Second Place, “A.I.” – Shepard; Third Place, “Man Up” – Shepard. News Story or Feature: First Place, “Pancake Breakfast” – Eisenhower; Second Place, “Petting Farm” – Southland Prep; Third Place, “Behind the Scenes of Stage Crew” – Eisenhower. News Program: First Place, “Talon Newsnet Ch. 5 Q1” – Southland Prep; Second Place, “Astroworld Media 3/1/2019” – Shepard. 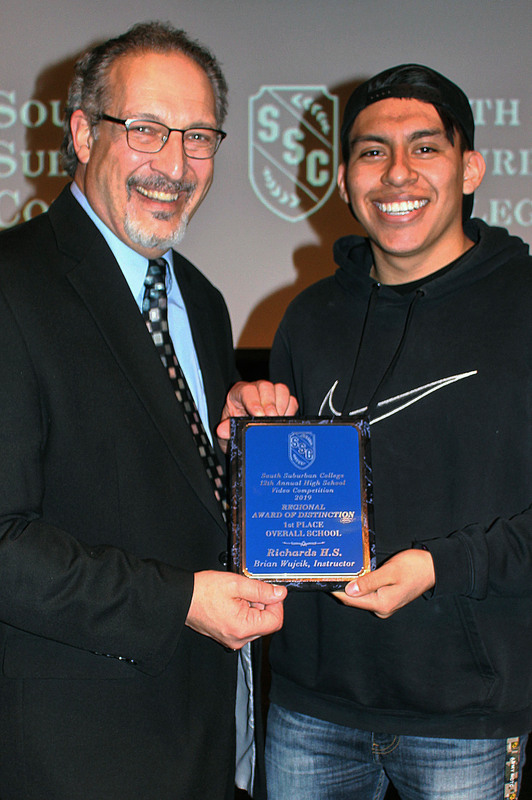 Pictured: John Geraci (left), South Suburban College Communications instructor, alongside Ivan Aragon (right), Harold L. Richards High School Senior, with the Regional Award of Distinction at the 12th Annual SSC Video Competition.